MARTIAL Law victims led by the Samahan ng Ex-detainees Laban sa Detensyon at Aresto (SELDA) today challenged President Noynoy Aquino to enact the Marcos Victims Compensation Bill into law as the nation commemorates the 40th year of imposition of Martial Law this month. 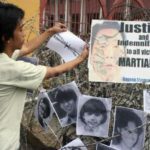 “It should make for a categorical pronouncement and decisive action to render the long-overdue justice for victims of human rights violations during the Marcos dictatorship,” said Bonfacio Ilagan, vice-chairperson of SELDA and a Martial Law victim himself. Ilagan was arrested, tortured and detained during Martial Law, while his sister, Rizalina, was among those who were forcibly disappeared. “We demand no less than that, as it has become extremely disappointing that the son of Ninoy, who fought Marcos’ martial law, continues to be remiss in expediting the measure that would at least help victims of the dictatorship gain some justice after all these years,” said Ilagan. “What’s keeping you, Mr. President? Is it the fear of the Marcoses, whose members are well-positioned again in politics — with Bongbong as Senator, Imelda as Congresswoman and Imee as Governor of Ilocos Norte — that has held you back in pursuing justice for the victims of martial law? Or is it because you have to keep them close to your heart as political allies, to include such a Martial Law relic as Senate Pres. Juan Ponce Enrile?” Ilagan asked. In May this year, Imelda Marcos ranked as the 2nd richest solon in Congress. In August, P36.55 million in her account at the Philippine Veteran’s Bank dwindled to just more than a million pesos due to still-unexplained withdrawals. Marcos crony Lucio Tan is US$23M richer, after the Singapore court awarded back to the Philippine National Bank this part of the Marcos ill-gotten wealth returned by the Swiss Government to the Philippines in 1997. “In his first two State of the Nation addresses, Aquino declared the indemnification bill a priority. But in his last SONA, he was completely silent about it. Meanwhile, the Senate, led by Enrile, has not even taken it up in its plenary sessions. SELDA is enraged that a long-overdue bill should further be delayed, while the money that Marcos stole from the Filipino people remains in the possession of his heirs, or else stolen once more by corrupt government officials in whose custody it was entrusted,” Ilagan decried. SELDA is set to conduct activities this September to push for the passage of the bill and demand justice for all victims of human rights violations from Martial Law up to the current Aquino.